So, the anticipation of all of you will now gradually end since this week because it’s going to be a big treat for everyone. We are finally going to have the first full-length trailer for Captain Marvel at sometime today. And it will be followed up by the most awaited thing, the Avengers 4 trailer which may be revealed on Wednesday. But right now the entire focus is on just one big character, Captain Marvel starring Brie Larson in the lead role of Carol Danvers. And just recently Marvel Studios has released a new poster for the movie which will be arriving on March 8th, 2019. And you can tell by looking at the new poster, above, that Captain Marvel looks all charged and geared up for coming face-to-face with the Mad Titan, Thanos, whenever that moment will come in the next Avengers film. Brie Larson’s character is appearing all tough and in the entirety of her powers. She is touted to be the strongest and powerful superhero among all the other Avengers. The first official teaser trailer for Captain Marvel was previously released in September and which was also the most viewed teaser or trailer of any MCU movie in 24 hours, after Avengers: Infinity War. The film is set in the 1990s and we will also see a younger Nick Fury in the story. It also stars Jude Law, Ben Mendelsohn, Djimon Hounsou, Lee Pace, Lashana Lynch, Gemma Chan, Rune Temte, Algenis Perez Soto, Mckenna Grace, Annette Bening, and Clark Gregg. The music score is composed by Pinar Toprak while the cinematography is done by Ben Davis. The movie is made on a budget of over $150 million. 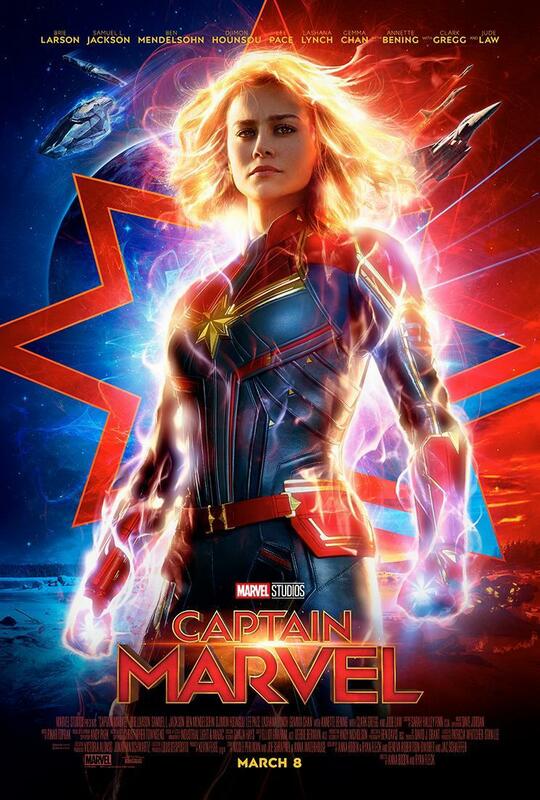 Captain Marvel is directed by Anna Boden and Ryan Fleck, produced by Marvel Studios and distributed by Walt Disney Studios Motion Pictures. Stay tuned for the upcoming new trailer which can arrive at any point of time later, today.